Using a camera trap, conservationists working in Kibale National Park in south Uganda have captured dramatic video of an African Golden Cat attacking a group of red colobus monkeys. In the video, taken by the Max Planck Institute for Evolutionary Anthropology, the elusive cat can be seen stalking and rushing a group of monkeys before bailing and retreating back into the jungle. The burly and reclusive African Golden Cat, Caracal aurata, is the continent's least-studied wild cat. It's about twice the size of a domestic cat and can be found in the rain forests of West and Central Africa. It's closely related to both the caracal and the serval, and is the sole member of the genus Profelis. Little is known about African Golden Cat behavior, but they've been observed to hunt both during the day and at night. 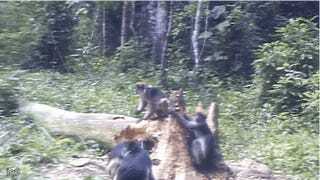 They typically feast on rodents, birds, suikers, hog piglets, small antelope, and as this video suggests, monkeys. Interestingly, this video arrives just days after the publication of the first photographs of African Golden Cat kittens. The photos show that the mothers can produce offspring bearing both colors of the species, a reddish brown and grey. Another recent film shows a cat sleeping in a tree in Uganda's Kalinzu forest reserve before it gets harassed by monkey calls.